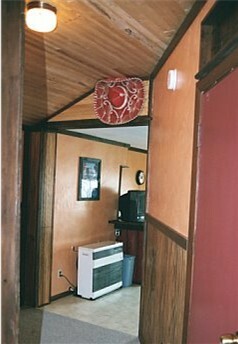 I need to do just a little venting… our red Mexican Sombrero was taken from a cabin. One such item is a Mexican Sombrero that we picked up in Tijuana many years ago. At the time, it was simply a fun thing to have, no real purpose. Now it only had one purpose: to use in our “Baja” cabin. The sad part is that one of our “guests” literally ripped it off the wall. I can say that because it was held up by 2 screws…the screws are still in place. My last say on this: whether you stay in a cabin, a hotel, a campground or at a friends home, be considerate of the people and the place. They took time to make your stay enjoyable and I think it should be respected. Big snowstorm yesterday and these guys went out in it. I am unsure of the totals as it continued to snow all day and into the night yesterday. Woke this morning to about 6+ inches of powdery snow. But with the wind, I cannot get an accurate measurement. Trails should be in great condition, just use caution, could still be icy in the corners. ITS 89 North – Groomers went last night and will go tonight. Trails are great, use caution, they should be in decent shape. ITS 89 South Groomer went last night and will go tonight. Trail conditions are very good. ITS 88 to Rockwood Groomer went last night and will go tonight. Conditions are still good, reports are coming in favorable. In Town Trails Groomers went last night and will go tonight, they should be in good condition. Watch for icy corners. Update on grooming, the 2000 New Holland is still in Sidney for repair, no word when it will be back. The grooming is still being completed in shifts remember to thank the drivers! We heard a storm was coming for Sunday all week and finally, last night around 9ish it started. We had some gals stay with us this week and all they brought in tow were their snowshoes and their X-country skis. 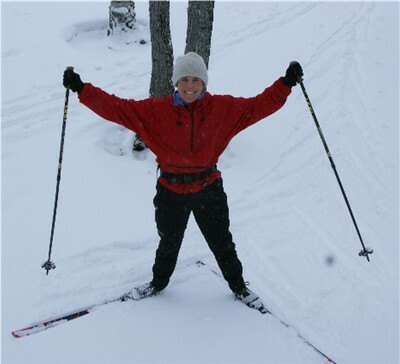 This is a shot of Lynn after she had an “incredible” morning snowshoeing across Big wood. She found an area around Gander Cove that was exactly what she was hoping to find on the skis. 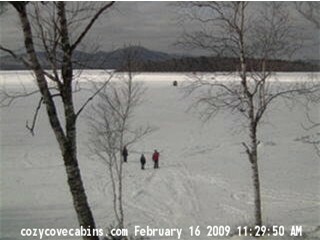 The first day, they walked across the lake and put on the snowshoes and hiked up to mud pond. Saw some deer and an eagle in flight. 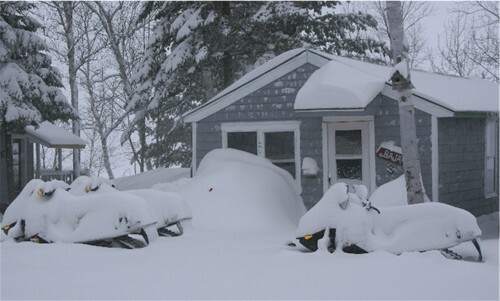 So you do not have to own a snowmobile or enjoy ice fishing to come up to Jackman. Put on the snow shoes and make your own path. What a wonderful day in Jackman today. It is about 20 degrees, very little wind and even though there are some clouds, the sun pops out once in awhile. Also for extreme details on the exact weather IN Jackman go to this address. You cannot get anything more accurate then the top of a building here in town. TRAILS ARE HARD AND FLAT, WATCH FOR ICY CORNERS, SNOWMOBILE WITH PRUDENCE. ITS 89 North – Groomers went last night and will go tonight. Trails are hardpacked, use caution, they should be in decent shape. 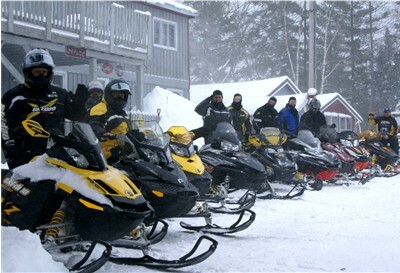 Border Riders North Groomer went last night and will go tonight. Is in very good condition. There is probably more snow on this trail for decent lubrication. 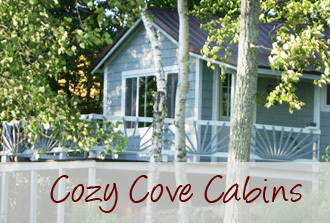 When staying at Cozy Cove Cabins, you can access the trails via Big Wood Lake also if you want to bypass the in town trails. Just use caution on the lake. Watch for ice fisherman and others expecially if the wind is blowing. We did get the rain that was in the forecast but on a good note, the temperatures are supposed to drop it is expected to turn to snow this afternoon 🙂 This will be good. Another good note: This is the first warm temps we had and the first rain all winter season so the snow that we have had, stayed. My theory is that if we do get a little more snow now and it gets cold, good chance that most of the trails will remain good for riding. 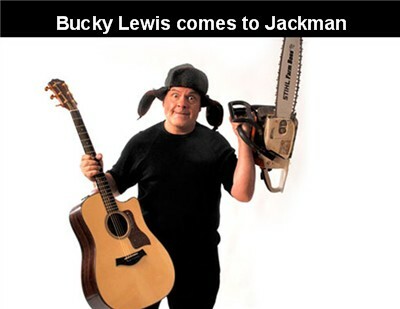 Make plans to spend a couple days in Jackman the weekend of February 28th-ride the trails, fish our lakes and in the evening, laugh OUT LOUD to the comedy antics of Bucky Lewis. This event is sponsored by the Jackman Chamber of Commerce and will also benefit the school with a spaghetti dinner right before the show. Tickets on sale NOW in town or you can contact the Chamber of Commerce at 668-4171.